Launched in November 2011, ANINI is the 7th unit of the Sunreef 70 Sailing successfully completed by the Sunreef Yachts shipyard. Sold to an American client for private use combined with charter activity, ANINI will spend the coming winter in southern Portugal before starting her Summer 2012 cruise in the Mediterranean, the sea that the owner wishes to explore as much as possible. ANINI is arranged in the owner layout version with the master suite and one guest cabin in the portside hull and two guest (one with bunk beds) and one crew cabin in the starboard hull. The inside of the main deck comprises the saloon/dining room on the left with two coffee tables convertible into one large dining table , a 40” LCD TV and DVD, and a fully equipped galley with an elegant and handy bar for serving drinks and meals. The interior navigation station is located in the front section of the main deck and comprises all the necessary navcom equipment (touch screens with multifunction displays, autopilot, GPS, radar, yacht controller, satellite phone, fish finder, etc). 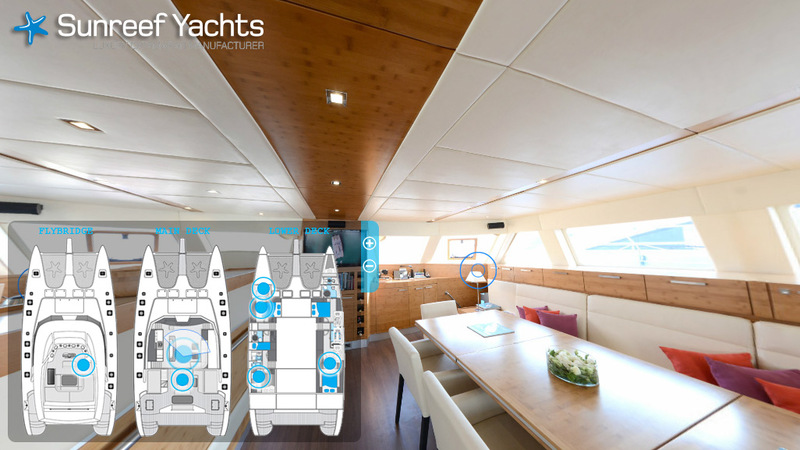 The aft deck features a dining area with a small fridge, large colorful sofas and sun pads, and extensive storage. The 27m2 flybridge includes the main helm station, and a dining area with a small fridge, sun pads and benches. Both the cockpit and the flybridge are finished in teak. The master suite includes a double bed with night tables, an extendable sofa, work desk, TV and DVD, and plenty of storage for long cruises. One of the guest cabins and the crew cabin are equipped with double beds, and the second guest cabin, intended for children, has bunk beds. All cabins have private en-suite bathrooms.